One of my new neighbors brought me a beautiful orchid that bloomed for almost a year. Recently, it stopped blooming and I thought it was “dead” and it would have to be thrown into the woods --the final resting place of every other orchid I have killed. There have been a few! However, Betsy told me to take it back to Chadwick & Son Orchids, Inc., where she had purchased it and they would nurture it back to bloom. She told me they “board” orchids by the thousands!! Boarding for orchids?! I had never heard such a thing. I decided to check it out and took my orchid, and another I had received, to Chadwick’s and sure enough there is an R&R camp for orchids. In fact, they have over 13,000 orchids they board for clients at their greenhouse. I checked in my orchids for the princely sum of $2 a month each ($24 maximum charge per orchid). I also was able to choose how I wanted to receive them back: full bloom, all buds, or a mixture of both. 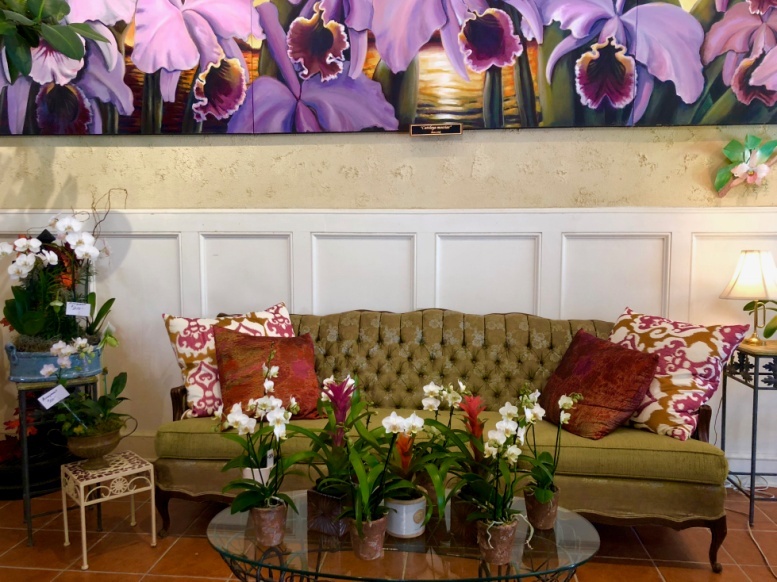 I was so intrigued with the entire concept of boarding orchids that I arranged to meet the President/Owner. 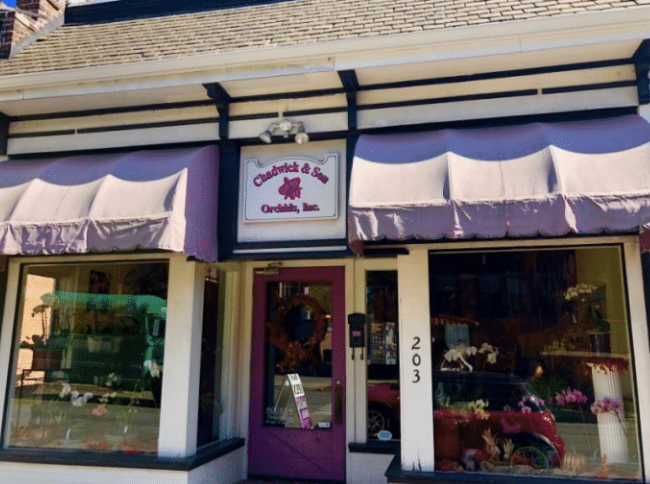 I sat on the inviting settee with Art Chadwick in his quaint Belmont Ave shop and he told me how he came to be in the business of selling and, more importantly, caring for orchids. He and his father had started the business in 1989 after Art quit his career as an electrical engineer, cold turkey. Together they built a greenhouse and the rest, as they say, is history. Growing organically (no pun intended!) through word of mouth, they now have eleven greenhouses and individual clients who board hundreds of orchids. 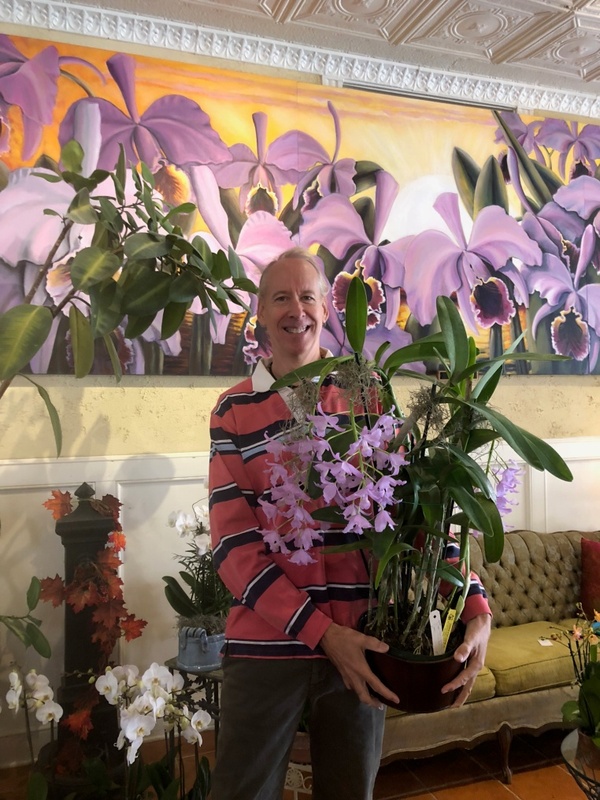 In fact, during our interview a client dropped off an orchid for boarding---one of fifty he boards at Chadwick’s, which he cycles through to guarantee year-round blooms. Art also revived a tradition of breeding unique cattleya hybrid orchids for the First Ladies of the United States. This was a practice that began in 1929 with Mrs. Herbert Hoover, but faded in the 1980’s after the corsage was no longer the rage. His “Blc Melania Trump” hybrid won a HCC (Highly Commended Certificate) award from the American Orchid Society in May 2018. Read more about this orchid and its prestigious award here. Chadwick’s has named a hybrid Cattleya orchid for the last five First Ladies beginning with Barbara Bush. When I met with him, Art had just returned from speaking to Laura Bush’s garden club. Other notables who have Chadwick’s orchids named after them are: Martha Stewart, Margaret Thatcher, Priscilla Presley and Farrah Fawcett. There is a large photo collage “wall of fame” at the shop. Worth the visit just to see who’s on this wall! For me personally, orchids seem to be the only house plant that I can keep alive and they seem to bloom forever! In the past I’ve only purchased these plants at grocery stores. Each grocery store version comes with its’ own little plastic shot-glass and instructions to give the plant a shot of water once a week or put an ice cube in the pot. Art has now educated me to the obvious: orchids are tropical plants that are used to wet, warm climates. An ice cube is the kiss of death for an orchid and the best way to water it is keep the roots damp. When the potting mixture feels dry, soak the entire root system in warm, not cold, water. Art was kind enough to give me over an hour of his time. During which, he had a number of customers come in for all aspects of orchid purchase and nurture. This is truly a specialty business that amazes me. It is another world and the love people clearly have for orchids is front and center. I stopped at Betsy’s house the other night and in her entry was a beautiful yellow orchid called the Dancing Lady (Oncidium). It was her mother-in-law’s and has been a boarder at Chadwick’s for over twenty years! This lady has been dancing for a long time!